This 180-page volume provides professional development resources that will introduce practitioners to the methods that underlie a balanced literacy classroom, as well as help them plan and extend their curriculum. 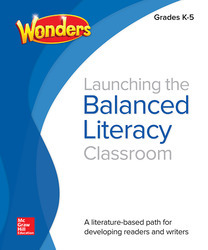 Offering a mix of research and advice from experts in the field — including Dr. Donald Bear, Dr. Douglas Fisher, and Dr. Jana Echevarria — Launching the Balanced Literacy Classroom delivers hands-on tips and techniques to help educators connect the latest findings on reading and writing with their daily practice. White papers and “In Practice” guides address the critical elements of the balanced literacy philosophy, such as read-alouds, close reading, collaborative conversations, word study, and more, and take each topic from theory into classroom use.